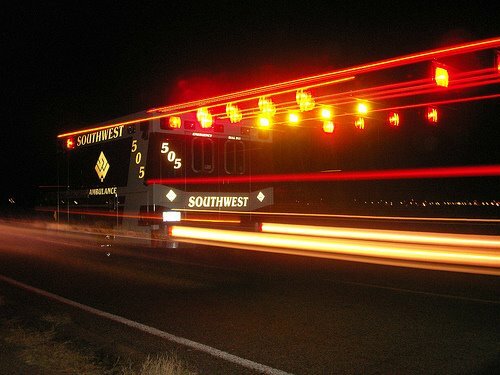 Okay, I didn’t get to go this fast, or look this cool, but I did get to work on an ambulance in East Oakland. Which was pretty amazing. – My favorite new politically correct term that has to go on paperwork: “Urban Camper”… Apparently homeless is out of vogue and offended someone, so now we have permanent urban campers or temporary urban campers. How I love America. – I didn’t get any pumpkin pie on Thanksgiving day. I had to settle for a pumpkin milkshake from Jack in the Box. Very sad times. – I was told three times last week that I look like Jodie Foster, a comment I started receiving three years ago. I just don’t see it, and considering she was born in 1962, either I am looking considerably old for my age or she is looking quite young and spry. – I became the proud owner of a MacBook on November 15th, 2008. It hasn’t told me it’s name yet, but I’m sure that will come with a growing relationship. – I found out that in order to give the proper amount of compressions per minute during CPR, you can perform them to the beat of either “Stayin’ Alive” or “Another One Bites the Dust”. However, I would warn that singing either out loud while delivering CPR may distress those around and lead to a lawsuit. – I am studying to take the National Registry Exam for EMT’s. In this exam all four of the multiple choice answers are often correct and you must choose the one that is most appropriate OR all the answers seem incorrect and you must choose the least inappropriate. What an odd way to write an exam! Slightly frustrating at times as well…. Hopefully more often posts will be coming in the next couple weeks, wanted to give the broad-stroke overview for now! Actually, I wanted to hear more about your experiences last summer with the Forest Service PSW Experiment Station. They employ EMTs. Is there some connection here? No connection. I wasn’t aware that they employed EMT’s – for what purpose? Employees responsible for or working in a crew environment (survey, fire, wildlife etc. )are likely to find themselves in a “first responder” type situation usually in a remote location and would benefit personnel and the organization with EMT credentials so we encouraged those so inclined to get the training. This was usually discussed during employee evaluation time updating the training plan. One with this training suddenly became in demand for fire assignments and quick response calls. You crack me up.And you’re pretty. I love you guys. And really miss you. You are hilarious, Nicole. I will remember to sing the songs under my breath if I ever find myself in that situation.